As a weapon, the sword first appeared as a simple long dagger made of tin bronze in ancient Egypt [1, 2]: even the swords used in the battle of Kadesh in 1274 BC were made of bronze [1, 3]. The long dagger shape sword developed into the sickle sword or Khopesh, which is characterized by a curved thick blade. With this shape, the Khopesh became one of the most important weapons in the ancient Egyptian army [2, 4, 5]. It continued to be made of bronze until the Iron Age which began in the Egypt at the eighth century BC. 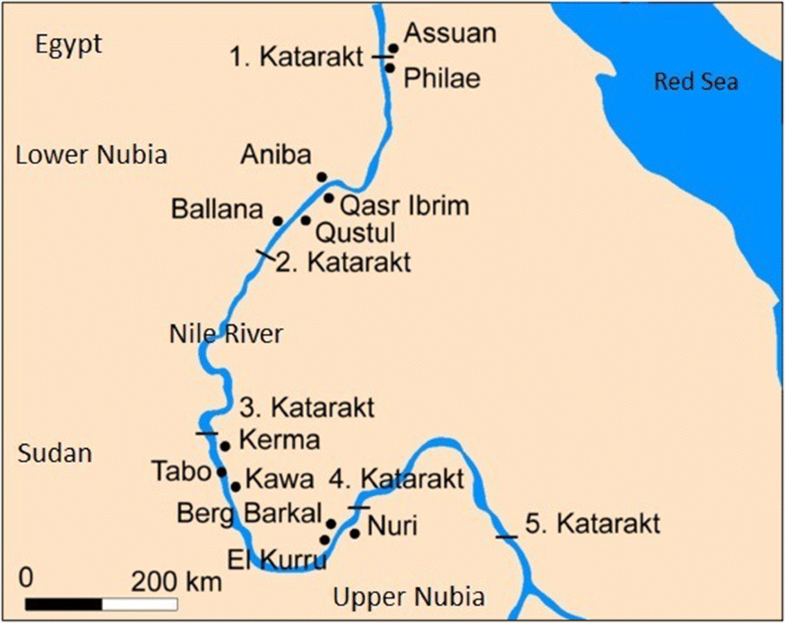 In ancient Egypt, Some iron artifacts were made of meteoritic iron before that time which shows the knowledge of how to extract iron from its ores [6–9]. Study on iron technology in the archaeological iron objects produced in the ancient time has been an interesting subject during the last decades. For example, a large number of studies are performed to analysis of chemical composition and microstructure of archaeological irons to show the technology of iron production and manufacturing of iron objects around the world by using various analytical and microscopic methods [6, 8, 9, 13–18]. 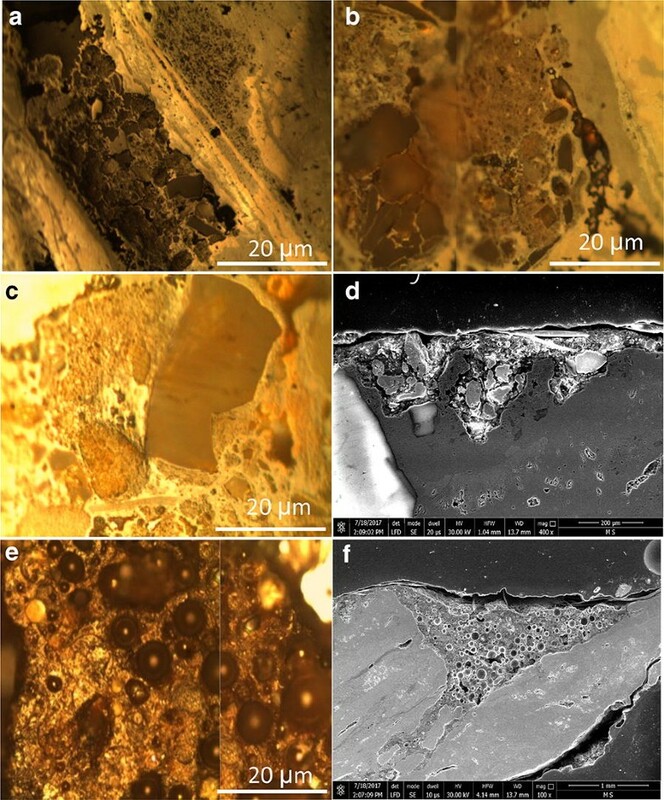 These variable studies have led to characterize the methods of production of different iron alloys in the ancient time with variable microscopic and microscopic characteristics. On the other hand, the corrosion mechanism and morphology of the archaeological iron artifacts has been the subject of many researches during the twentieth and twenty-first centuries. 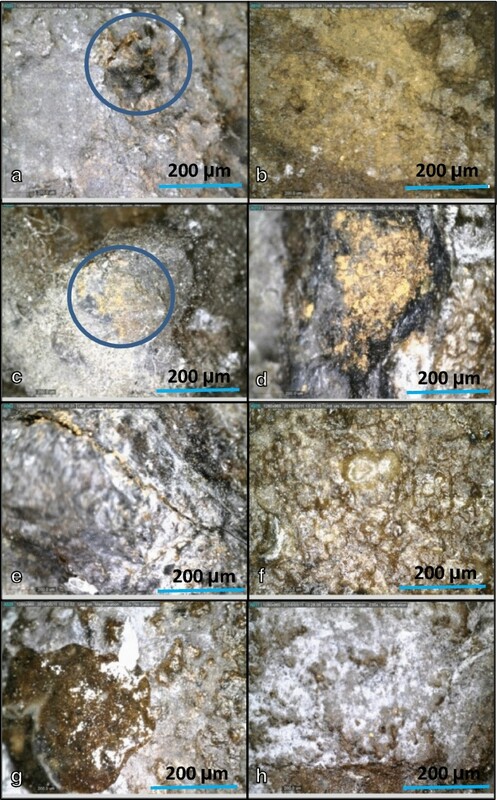 The study on corrosion occurred in the archaeological iron objects has helped the scientists to understand the physico-chemical events that led to corrosion in the buried iron alloys as well as to conservators to characterize decay mechanism and to control the deterioration in the excavated iron objects [19–26]. It shows obviously that the technology and corrosion of archaeological iron objects is an important subject for scholars from various disciplines, especially when the results lead to preserve these types of cultural heritage objects. The carbon/sulfur analyser and energy-dispersive X-ray spectroscopy revealed that the metallic matrix of the sword is of low-carbon steel , the main element is iron with impurities mainly consisting of carbon, silicon, aluminium, and phosphorus as shown in Fig. 4 and Table 1. The presence of silicon in the matrix of archaeological iron objects is not related to any deliberately addition but it appears as the main element of the Si-rich phases of slag inclusions (SiO2–rich slags) which formed during production process. The presence of slag in ancient iron is not only due to the ore used but also the smelting system in ancient furnaces, which involved fuel ash, fluxes and furnace lining, as is often suggested in recent literature and reports [31–33]. Chemical compositions of the silver sheet of the hilt was measured by pXRF on three spots and showed that this sheet consisted of silver as a major element and copper as a minor one (Table 1). It shows that the silver sheet has been manufactured from the silver-copper alloy with about 3 wt% of Cu. It may has been added to the silver to increase its strength and hardness . Microscopic observations revealed that the internal corrosion layers of the sword are similar to the corrosion morphologies observed in many iron artifacts buried in the soil environment. The sword was completely covered with a thick corrosion crust mainly constituted of two layers including the internal or the dense product layer (DPL) and the external or transformed medium (TM) (Fig. 5a) [20–22, 35–38]. Based on the literature, DPL layer is an internal corrosion layer formed beside of the metal substrate in which some internal markers such as probable slag inclusions may be visible. It is usually including oxide/oxyhydroxide iron corrosion products. Furthermore, the TM layer is an external corrosion layer occurring between DPL and non-altered soil in which different iron corrosion products and soil particles are mixed together. The interface between DPL and TM may be the place of the original surface that may have moved during the corrosion events [20, 21]. 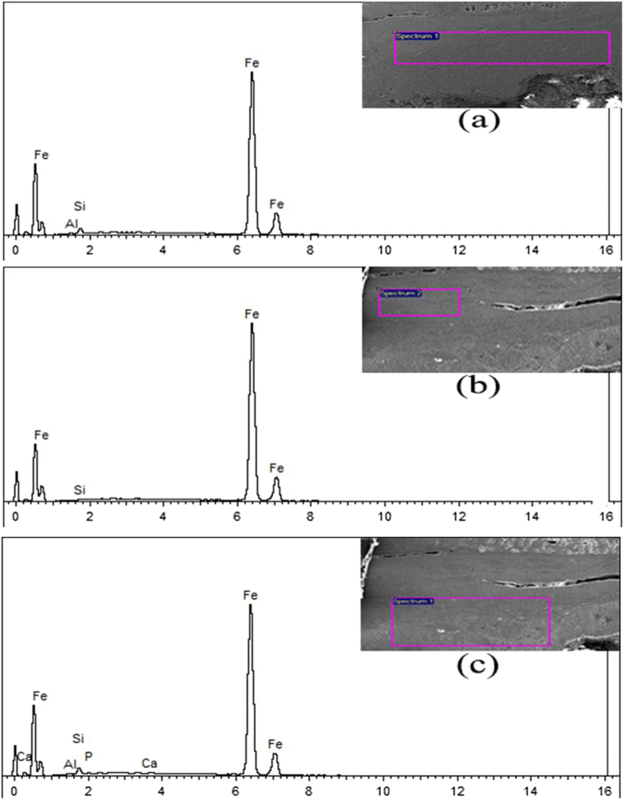 Corrosion products of the DPL layer were identified by micro-Raman (Table 2) before the etching; this is important because the etching could alter the corrosion products. Raman spectrum analysis of the light yellow corrosion area, which formed at the most areas of the DPL layer, provided a sharp and high band at 666 cm−1 and the next strongest peak at 300 cm−1 as in Fig. 6a. These two bands are attributed to magnetite (Fe3O4) [20, 35, 40–42]. 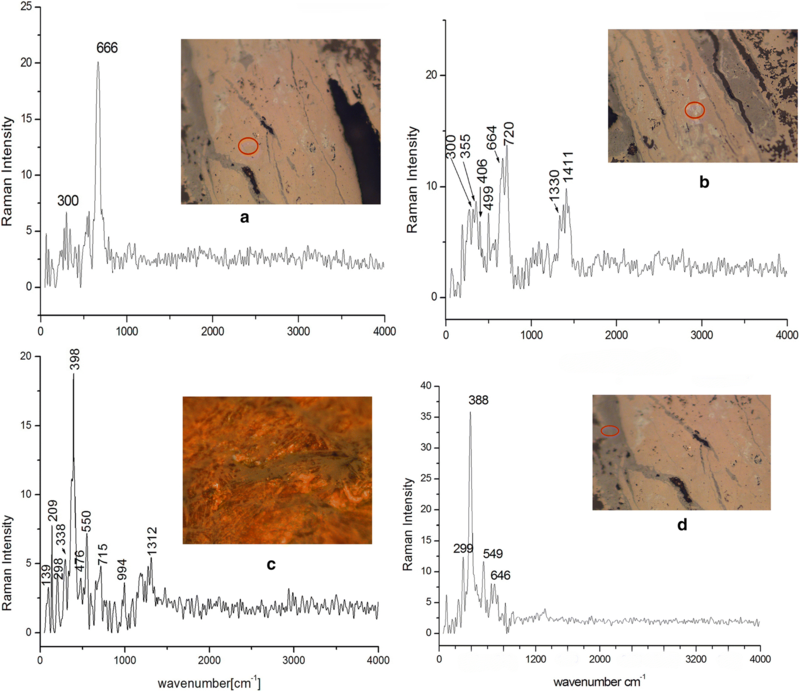 Furthermore, Raman spectroscopy revealed that discontinuous strips with color of light marbling in the DPL layer are composed of akaganeite (β-FeOOH) mixed with maghemite (γ-Fe2O3), Akaganeite is defined at bands 720, 319, 400 and 551 cm−1  and maghemite at 720 and 664 cm−1 [43, 44], as shown in Fig. 6b. The orange which appears in TM/DPL interface was also analyzed using Raman spectroscopy. 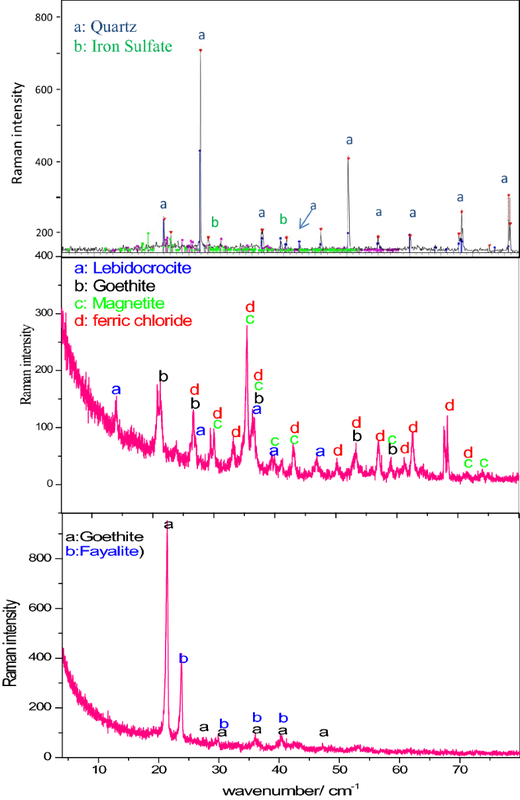 The results showed lepidocrocite (γ-FeOOH) as a corrosion product of the orange color detected at a large and intense band at 398 cm−1 and various medium bands (139, 209, 338 and 1312 cm−1) (Fig. 6c) . The second layer is the transformed medium layer (TM) which has high porosity and has been transformed to the mineralized products. Microscopic examination showed that this layer probably consist of a gray phase mixed with some soil minerals. The gray corrosion phase is the main phase of this layer, Raman spectrum of this phase gave four bands (388 cm−1 as the major peak and 299, 549, and 646 cm−1 as minor peaks). These corresponded with bands of a goethite corrosion product (α-FeOOH), as shown in Fig. 6d [43–45]. Soil minerals and goethite were observed in the microstructure of this layer by SEM and OM (Fig. 7a–d). 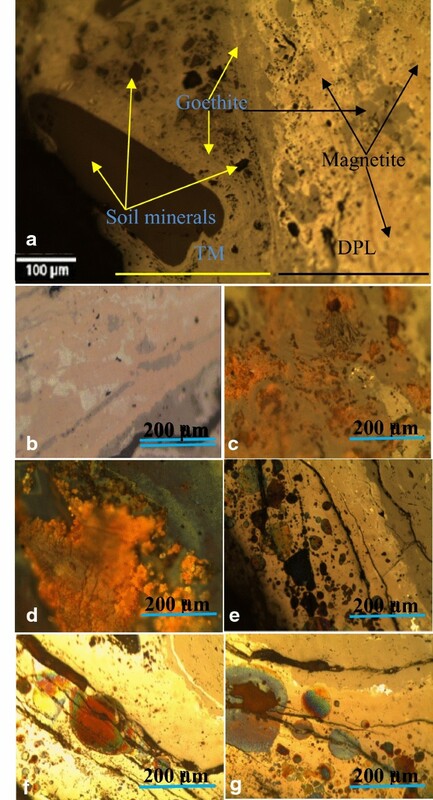 Some areas of the outer part of the TM layer are very rich in soil minerals, more than the goethite corrosion, as shown in Fig. 7a, b. The TM layer contains one of the most important decays features of iron artifacts. This phenomenon as known as weeping; the term “weeping” is used for the hollow beads observed in the corroded surfaces of the excavated irons from the soil environment, as shown in Fig. 7e, f [28, 37, 40]. The weeping indicates that the artifact suffered a progressive stage of corrosion under influence of Cl-contamination of the object. In some cases, it is considered as a way to determine the authenticity of iron artifacts [28, 40]. The color of this shell was blackish brown and was identified in previous study by Raman spectroscopy as akaganeite  and in another one was identified as (α-FeOOH), lepidocrocite (γ-FeOOH) and akaganeite (β-FeOOH) . The presence of fayalite (Fe2SiO4) was also characterized by XRD (Fig. 8). This is a phase formed at high temperature and should not occur due to reaction of the iron with silicon in the soil. Rather, it is clear that this phase originates from the slag inclusions of the metal. The fact that slag inclusions contain fayalite in ancient metals is well known and widely published [32, 33]. The expulsion of slag in ancient smelting furnaces (bloomer furnaces) was never perfect . Therefore, slag inclusions are commonly found in the microstructure of archaeological iron artifacts. The earliest analytical studies of the slag inclusions entrapped in iron were produced in bloomery furnaces [31–33, 46, 47] and revealed a systematic and highly repetitive pattern in slag composition, with most smelting slags plotting in the fayalite region of the FeO–Al2O3–SiO2. Consequently, the crystallized phases inside the slag inclusions were often identified as fayalite and wüstite (FeO) [46, 47]. The corrosion system on the studied sword was formed of two layers; DPL and TM layer. The composition and morphology of the two layers have been summarized in Fig. 9. The DPL is the result of the internal oxidation/corrosion of iron under influence of the burial environment. In fact, The DPL is formed on the metallic substrate by the iron oxidation and its thickness may be variable in different objects from various burial environments. Although, DPL is formed as oxide/oxyhydroxide iron products, it is possible to observe other iron minerals in the composition based on burial environments [20, 21, 48]. The mechanism of formation of the studied DPL layer and its products can be explained as follow: In the beginning of the corrosion process, because high aeration of buried soil, mainly magnetite forms. With the long-term burial and continuous reaction, magnetite layer increased and cracks, parallel to the metal/magnetite interface can form. Burial environment is close to the river Nile and thus the soil is saturated in water. The magnetite layer is connected with the soil and thus its cracks become saturated in water. With the presence of water in the metal/DPL interface, Fe continued to the oxidation to Fe2+ and as results of this there are two hypotheses; the magnetite layer increased and other phases formed . Lepidocrocite and maghemite in DPL are a common transformation of magnetite. Some previous studies have indicated that magnetite may alter to maghemite or lepidocrocite [49–52]. Akaganeite formed as results of chlorine in the soil water [20, 22].